Hoist Cylinder for RT555 Part Number T125505 It has been Re-Sealed Call 1-800-342-7575 for a quote! 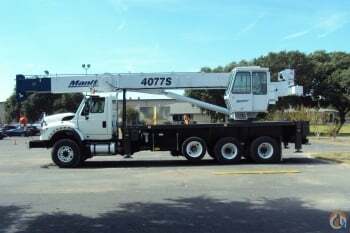 Contact Dereck@EmpireCrane.com New - Never used Terex-Demag Block. Ready to sell for best price offered. 63-Ton, 6-Sheave, 16mm Wire Rope, 1,058 lbs. Also comes with double hook Attachment!! Link-Belt 25' x 60" x 54" x 3-5/8" Tubular Boom Tip, CranesList ID: 301, Fits: LS408 / LS418 / LS418A, Part Number: 9M 3630, Tag is not shown, Needs Work, CALL FOR PRICING http://www.CranesList.com LOCATED IN TEXAS! Hook Block for Sale: 28 Ton, 1 Sheave, 3/4" wire rope. 716 lbs. Call 1-800-342-7575 for a quote!